WWF’s Hue office goes solar! Last December, WWF’s Hue office installed a 5 kilowatt (kW) solar photovoltaic (PV) system on its roof, embracing a smarter, more sustainable approach to energy. Vietnam has an abundant solar resource, with particularly good potential for solar power in central and southern regions. Rooftop solar PV generates clean, safe and reliable electricity, and with the price of systems rapidly reducing in recent years, solar is an attractive option for homes and businesses. Through a one-off investment in a solar system, WWF Hue has reduced reliance on grid electricity and will save on the office energy budget in the long run. The system is estimated to generate approximately 7085kWh/year, saving WWF around 1,536 USD in electricity purchase costs avoided in the first year alone, and around 34,949 USD in total savings after 20 years, with a payback period of around eight years (this is with a non-ideal roof orientation – east-west). But solar is about much more than saving money. Some of the many advantages to solar are its potential to reduce traditional fossil fuel dependence and meet growing energy demand while also addressing climate change and air pollution. Vietnam’s energy demand is surging. Relying on coal to meet this demand would increase dependence on imported coal and expose Vietnam to global price volatility and risks of disrupted supply, as well as causing pollution, health costs and climate change. Without changes, expected import share of total primary energy is expected to increase to 37.5% in 2025 and 58.5% in 2035. It’s not just energy security at stake. Vietnam is highly vulnerable to climate change, ranking eighth in the Global Climate Risk Index, considering cost in loss of gross domestic product and human lives. With one of the fastest growing greenhouse gas emissions in the region, a socially equitable transition to a sustainable energy sector is critical. Solar power is at the core of a transition towards a low-carbon economy and will play a key role in Vietnam delivering its commitments under the Paris Agreement of the United Nations Framework Convention for Climate Change, including a conditional GHG emissions reduction target of 25% by 2030 compared to business as usual. 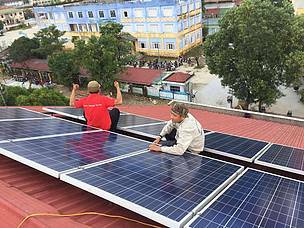 Solar will also play a central role in the delivery of Vietnam’s renewable energy targets and policies such as the Renewable Energy Development Strategy. The Revised National Power Development Master Plan for 2011-2020 with the Vision to 2030, promotes renewable energy and climate change mitigation, with a target to increase the share of renewables in electricity production (excluding hydropower) to 7% in 2020 and more than 10% in 2030. In a positive move for those thinking of going solar, Vietnam recently issued a feed-in tariff of 2,086 VND/kWh (9.35 US$ cents/kWh) for solar PV. This is the amount paid for any electricity a solar PV system generates that isn’t used, and is instead fed back into the grid. Solar rooftop projects can apply net metering with two-way electricity meters, where if the electricity generated in a payment cycle is greater than consumption, it must be transferred to the next payment cycle. At the end of the year, excess electricity generated is sold to the Vietnam Electricity Corporation (or authorized member companies) at the tariff rate. Despite progress, Vietnam continues to rely heavily on coal and according to government plans, the use of coal power will further increase in years ahead. Currently, the country’s deployment of wind or solar PV power generation is limited, with only 160 MW of installed wind power and solar PV capacity. Deployment of renewable energy (excluding hydro-power) remains limited compared with potential. WWF’s alternative vision for Vietnam’s power sector, developed in cooperation with Intelligent Energy Systems, showed that another future is possible, where a diverse mix of renewable sources can meet nearly all of the region’s electricity demand for all by 2050, with around 25% of the generation share coming from solar, with 71 GW of installed capacity. By going solar and encouraging staff to use energy more efficiently, Hue field office of WWF-Vietnam is practicing what we preach – showing a commitment to sustainable energy, and hoping to inspire others to do their part. Vietnamese cities are already joining the fight against climate change. Hoi An, Dong Ha, and Da Nang in central Vietnam followed the steps of the ancient capital of Hue, entering the WWF One Planet City Challenge program 2017-2018 and committing to reduce carbon emissions and develop action plans to reduce their impacts on our climate. WWF hopes that its efforts in energy efficiency and solar energy in its office can serve as a source of inspiration and experience for the city of Hue. By installing solar and adopting more energy efficient practices you too can play a role in driving more sustainable, low-carbon development across the country – saving energy, saving money and helping to save the environment. The solar PV installation was funded by WWF-Switzerland as part of WWF’s Solar and Energy Efficient Office Initiative which aims to bring solar electricity to WWF offices in combination with energy efficiency training for staff and to raise awareness on energy use through the electricity consumption monitoring tool, Smappee. Kreft, Sonke, David Eckstein and Inga Melchior, Germanwatch, 2016. Global Climate Risk Index 2017 - Who Suffers Most From Extreme Weather Events? Weather-related Loss Events in 2015 and 1996 to 2015. Bonn.